iPhone : There are significant security concerns, BBC link 2 ^. However, Ciaran Martin, head of the National Cyber Security C entre seems to suggest there maybe some way forward to work with FVEY on this. Please remember each FVEY country is undergoing a culturally unique kind of attack. iPhone : So maybe she didn't make the decision by herself, although clearly there was well founded disagreement. 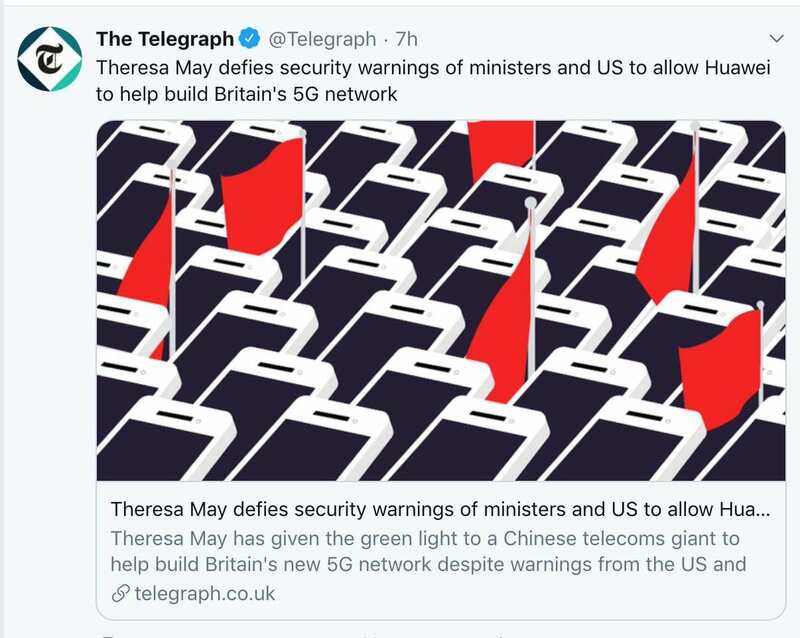 iPhone : Lets start with point of origin story in the Telegraph. Maximum outrage producing headline & last thing people see before bed if they are news watchers. Its like May does this by herself: pic 1. BBC ^^ link 2 adds more subtlety: pic 2.
iPhone : Story is evolving quickly. Maybe no fast conclusions & maybe a bit confusing right now. Let's try to walk through it. iPhone : Nobody seriously acquainted with Russians and counterintelligence ever considered the Steele dossier to be more than uncorroborated raw HUMINT. iPhone : MSM journalists are, with few exceptions, generalists; they don't have deep knowledge of any subject. iPhone : 🌟Suzanne: Families Belong Together 🇺🇸 yvette swegheimer(authentic acct) lmenz Joans Rules! ⚖️🛡️⚔️⚔️⚔️ Theresa Brennan 🍊 Call Pauls Boutique Pinche-Pastor of Our 🚺of the🖕 ᑕᕼᑌᑎK Sheila Puryear Karol 🌿 Louise Mensch John Schindler You ladies are all epic. Proud of my friends that I love so mucho mucho. iPhone : Karol 🌿 Dorothy Nelson Long live the Queen!! !